* At the moment not all the pics are online, but it's a start. * Still working on a Flash intro. * Updated my Journal of my American adventures. * Added the new pics to the USPics section. * Updated the About me section. * Finally restyled the Spotters section. * Updated the Links section. Hi, Welcome to my homepage. As you can see it is about Aviation. You can navigate your way around by clicking on one of the buttons in the menu on the left. Amsterdam Airport Schiphol, plus a Specials section with 2 rare 'mishaps' at Schiphol. Even a report about an aborted take off made by an F100 from Air UK. Cityhopper Fokker 50 on runway 19R 'Zwanenburgbaan' at Schiphol. flown by my ICQ friend, Dave Wester. 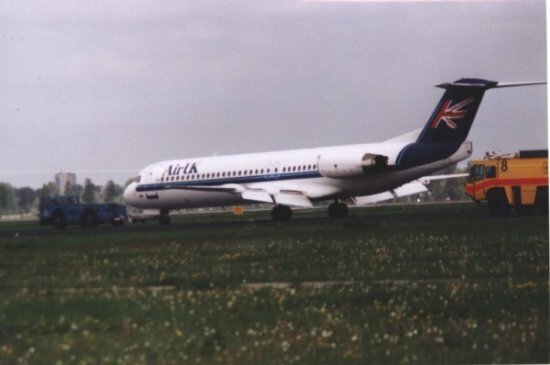 ELY 1862, the El-Al plane that crashed into a flat building in Amsterdam in 1992.
you go spotting at Schiphol. You'll also find the most used frequencies for scanning here. related as well as a few non-aviation related links. In the About Me section you'll find some information about me, webmaster of this site. student pilot at ACA, through IAC. something in my guestbook. Feedback is always welcome!